1 bottle contains 60 tablets. 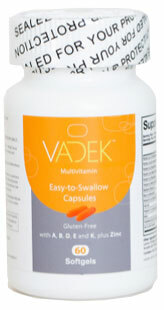 Easy-to-swallow capsules with 3,000 IUs of D3 and other fat and water soluble vitamins to meet the Step 1 increase in patients with low vitamin D levels. 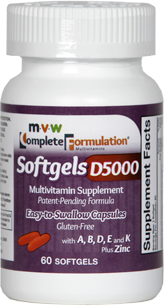 Easy-to-swallow capsules with 5000 IUs of D3 and other fat soluble vitamins to meet the Step 2 increase in patients with low vitamin D levels. 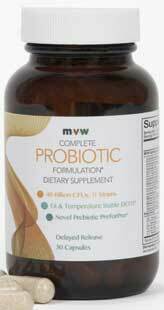 MVW Complete Formulation Multivitamins are specifically formulated to meet the needs of individuals who have difficulty absorbing fat and fat-soluble vitamins, as seen in cystic fibrosis. 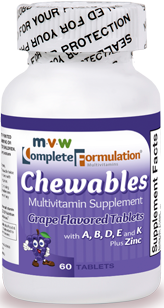 MVW Complete Formulation Multivitamins provide the fat-soluble vitamins A, D, E, and K in a water-miscible formulation, plus B vitamins, vitamin C, folic acid, and zinc. 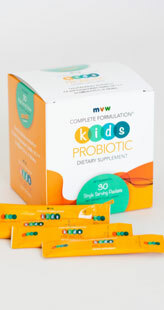 The product contains the antioxidants beta-carotene, ascorbic acid, alpha-tocopherol, and zinc. 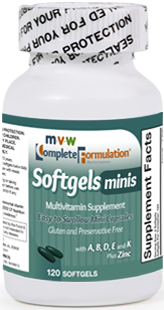 MVW Complete Formulation Multivitamins were designed to meet the daily supplemental vitamin recommendations outlined in the Cystic Fibrosis Foundation Nutrition Consensus Statement published in 2002; the recommendations for vitamin D as described in the 2011 Endocrine Society Clinical Practice Guidelines; and vitamin K as recommended by the 2002 European CF Society Nutrition Consensus Report.